We've been in our home for a few years now and I've done a lot of work of remodeling and I even created a therapy/playroom for my children. I'm not done working on our playroom and there's a ton I want to add to it, one of those items on my list was flooring-- foam tiles to be specific. I've seen foam tiles as flooring in multiple places and I knew they would be great in our therapy/playroom, and thanks to FoamTiles.com I get to check one more exciting thing off of my "wish list!" At FoamTiles.com you will find a variety of tiles and mats. From soft wood to carpet, they have many solutions to transform the look and feel of any space! I chose a box of Royal Blue and a box of Black Premium Soft Tiles. These foam tiles are available in a variety of colors plus they are lightweight and are portable! Each tile comes with two detachable edge pieces which makes locking them together super easy! Premium Soft Tiles from FoamTiles.com were designed for areas where a soft flooring solution is desired, making them the perfect flooring option for day care centers, home exercise rooms, play-room floors & more! Excuse the foot prints, I didn't realize my shoes were dirty when I was laying the tiles down! My tiles were ready to go right out of the box, within minutes I had all of my tiles locked together & laid down on the play room floor! The Premium Soft Tiles are so soft, super easy to install & they look amazing! I chose to use our new Premium Soft Tiles in the play room floor because we spend a lot of time in there. Our flooring throughout our home is pretty new and I want it to last several years. I know children can be rough on flooring, but I also wanted to provide a soft and nice flooring solution that worked for us. When my children saw the new playroom floor they were excited! My son immediately sat down and started to feel the tiles, and right away he loved the texture and couldn't wait to start playing on his new flooring! So what do you think? Do you have a room in your home that could use FoamTiles.com? Connect: Be sure to stay connected with FoamTiles.com on Facebook, Twitter & Pinterest! Buy it: The Premium Soft Tiles can be purchased online at FoamTiles.com in 11 different colors! 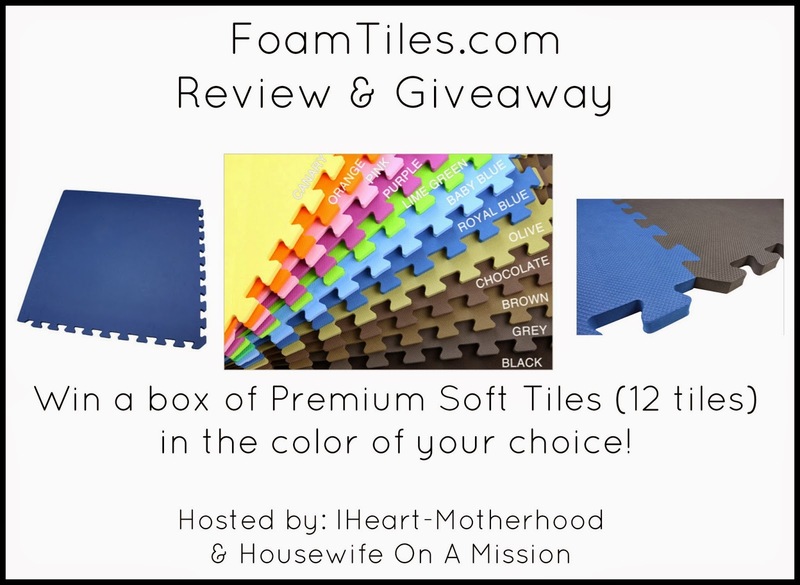 Win it: One lucky reader will win a box of Premium Soft Tiles (12 tiles) from FoamTiles.com in the color of your choice! Disclosure: This giveaway is sponsored by FaomTiles.com. IHeart-Motherhood & Housewife On A Mission are not responsible for prize fulfillment. This giveaway is not affiliated with Facebook, Twitter, Google+, Pinterest or Instagram. This giveaway will end May 12th. Giveaway is open to anyone in the US, 18+ & older. Winners will be posted via Giveaway Tools. No purchase is necessary & void where prohibited by law! I would use these in my step daughters room and I would probably choose the chocolate color. Thank you. I would love to use Premium Soft Tiles in my finished basement room. I would pick a blue color. I would choose chocolate or grey and put it my boys' room. These are awesome! We have concrete flooring and tile throughout most of our house so we'd use these in the family room where we spend most of our time. I would choose purple and/or pink. If I were to win, this would be a gift to my son and daughter in-law to use with my grandson. They'd probably use it in his room and pick a brown color. Thanks! I would use this in my little girl's room! I love the olive color!